In 1965, a rough-and-tumble band of rock ‘n’ roll upstarts called The Rolling Stones were just beginning to build their legend, when wily manager Andrew Loog Oldham engaged English documentarian Peter Whitehead to follow the band around for a couple of days during a short stint in Ireland. The result was Charlie Is My Darling, a cinéma vérité snapshot of an era when the cultural revolution was only just beginning to crack the façade of the Old World. 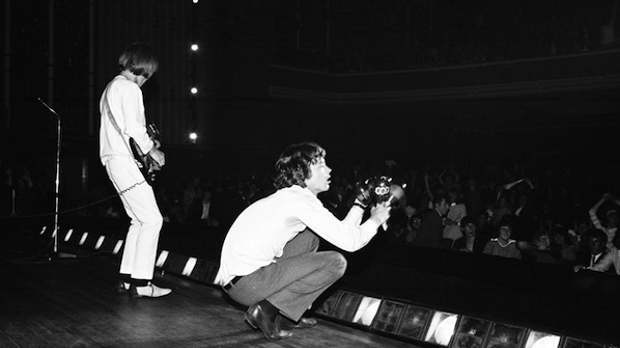 We see the young Mick Jagger, Keith Richards, Brian Jones, Bill Wyman, and Charlie Watts (who gives the film its title) brainstorming on songs, barnstorming onstage, engaging in candid conversation, and even inspiring (though not inciting) a riot. Unfortunately, Whitehead’s work ended up buried amid the heady rush of mid-‘60s Stones activity, and Charlie Is My Darling became an exotic cinematic beast of mythic proportions, never made available for public viewing. Luckily, the folks at ABKCO Music decided to rescue Charlie from obscurity in time for The Stones’ 50th anniversary, painstakingly restoring the film and extending it to 65 minutes with previously unseen footage. The 2012 version, The Rolling Stones: Charlie Is My Darling – Ireland 1965, also includes Whitehead’s original 35-minute version as well as Oldham’s subsequent 50-minute producer’s cut. The restoration project’s producer, Robin Klein, shared her stories about bringing the world’s first rock documentary back from purgatory. Filmmaker: How was the decision initially made to restore Charlie after all these years? Filmmaker: So what was involved in the restoration process? Klein: They spent the whole summer — the editor, God bless his soul, is Nathan Punwar, and he read lips and read guitar strums and body language and where they’re standing [onstage]…and he broke it down into songs. We had no guidelines; we were figuring this out as we were going along. So Mick [Gochanour, the director] put together a piece for us to view, and we knew we had something special. That was when we were given the okay to go to London and go through the footage and see if we had everything, and find the best source of what we had. Remember now, we were dealing with work prints, positive prints and negative that was never processed – that means that Peter Whitehead never saw it. So the first part of our goal was to make sure that we had everything. Second part: making sure that we have enough coverage so that we have songs. Third: making sure we’re using the best source for that shot. Some of the cutting copy looks like it was dragged across the cutting room floor, it’s totally scratched, and being stored for 45 years it’s stretched and broken and brittle, and it’s 90,000 frames that we have to put through this scanner. It was a shitload of work making all the different sources look like they’re coming from the same place. It took months and months and months. But I think it looks okay. Given the fact that it’s 45 years old, it looks pretty damn good, and it sounds amazing. Filmmaker: It’s fascinating to see not only the band in such a formative phase, but the first glimpses of the counterculture that they ended up representing. Filmmaker: In retrospect, Peter Whitehead was the perfect choice to capture something like this, having done another sort of early-counterculture documentary, Wholly Communion, just before this. Klein: What also makes it good that it’s Peter Whitehead is that he’s not in it, he’s not enthralled with it; he kind of doesn’t trust it yet. He’s just kind of mystified by it all. So he almost gives it an objective view. Filmmaker: It was never intended to be a movie though, right? Klein: It was just a screen test. Andrew [Loog Oldham, the Stones’ manager] had his eyes on The Only Lovers Left Alive, a film project, and Clockwork Orange [for the Stones], because The Beatles had done A Hard Days Night…so he said “Well, I want to see how they look [on] film, to see how they are in front of cameras,” so he hired Peter. Filmmaker: One of the most striking scenes is the riot at the concert. Was that common for the band at the time? Klein: The beginning of many to come — I think Charlie says in [the Stones documentary] Crossfire Hurricane that might have been one of the first, and then there wasn’t one [concert] after that didn’t have one. Filmmaker: Once the kids swarmed onstage, they didn’t seem sure why they were doing it. Klein: “What am I doing, why am I doing this, what am I supposed to do once I get here?” Absolutely. It’s funny. And Charlie says in his book that as far as he knows…up until this point they had only played in front of television audiences that had been filmed. Never had a concert been filmed before. So one could say that this is the first rockumentary in that it predates the Maysles [brothers]. Filmmaker: The Stones really weren’t even fully formed as people yet. Klein: They’re 22 and 23, their frontal cortex hasn’t formed yet. But yet Mick is smart enough to see the future. And Andrew is smart enough to know what works, knows how the human mind works, to make these guys the bad boys. It’s amazing. Filmmaker: What was the band’s reaction to Charlie being resurrected? Klein: When they saw it — we gave it to them to sign off on, or for improvements or suggestions — they handed it back without one comment, so that means success. Usually they want to change something here or move something there – nothing, not a thing. If he [Jagger] wanted to he could, just to break our balls, but he didn’t want to. Filmmaker: How much of Charlie is used in HBO’s new Stones doc, Crossfire Hurricane? Klein: It’s the only footage that shows them in 1965 performing, and it’s the only footage outside of newsreel footage of them in ‘65 that exists, so they were very interested in it. There’s a lot of excerpts — a quarter of our film. But they didn’t restore it. So you can see actually what we were doing, which is kind of a nice plus for us, but it’s too bad they didn’t restore it. They used a little bit of performance, they used “Sitting on A Fence,” when they’re writing the song, they used them at the piano, little bits…you don’t get to see the friendship develop. There’s voiceover over these scenes, whereas in our scenes you watch them get shitfaced and start singing Beatles tunes, so it’s a very different usage. Mostly they use our crowd footage. In most documentaries about the Stones, they’ve always used the Charlie crowd footage, because it’s so desperate. Filmmaker: What are your own favorite moments in the film? Klein: I have my little favorite characters, and little ways that they say things. I love the 40-year-old woman who says, “I ought to have my head examined”…I love the gay guy that’s standing in front, next to the priest, that had to be carried out. He’s sobbing uncontrollably during “Satisfaction,” and the cops had to bring him out, because you can’t have that kind of behavior, you can’t have homosexual behavior next to your priest. And there’s a line where Mick says “periphery,” and he swirls his neck. [laughs] I love that. In the screening, the people that worked on it, I looked around and everybody went like that, they made the movement with the neck. Those are my favorites. Obviously my favorite part in the film is them writing “Sitting on a Fence,” and Charlie holding his room key ready to go home. But I love — because we had more time — the way we got to capture the countryside and the people at a point in time when it would never be the same again.